Two suspects who burglarized a Rockville gun shop last week remain at large, and now law enforcement officers believe they may be linked to another recent burglary in nearby Virginia. Montgomery County police officers were alerted to the crime scene last week by the store’s alarm system at round 4 a.m., and they quickly responded to the Rockville shop to find the door pried open and glass cases smashed. Several firearms were taken from the glass cases as well as from racks behind the counter. In total the store reported more than 30 missing handguns and long rifles. The burglary gained national attention after the entire 90-second spree was captured on two high definition cameras, which were played for television and internet audiences. Both suspects were covered head to toe on black garb, and their faces were covered, thus making visual identification nearly impossible. A small clip of one of the suspects warning the other that it was time to leave the scene is audible and the burglars were allegedly spotted fleeing in a light colored four-door sedan, but there does not appear to be any other identifying information on the pair. There is no word yet whether crime scene investigators were able to recover any beneficial forensic evidence such has hair, skin or shoe samples. Another gun store was burglarized this week in the same manner, and law enforcement officers are searching for clues as to whether these two smash and grabs are linked. The suspects in the Fairfax County crime were dressed differently, but appear to be similar in stature to the suspects in the Rockville burglary. Montgomery County Police are joined by federal agents from the ATF and Virginia officers in searching for leads to these two burglaries. If the suspects are apprehended they could be prosecuted under state law, federal law or both. Under Maryland state law the actions of the two suspects would be classified as a second degree burglary. 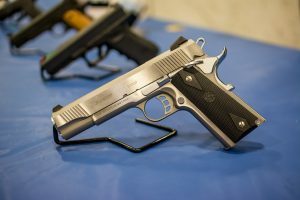 There is a special provision under 6-203 of the Maryland code that deals specifically with breaking and entering with the intent to steal a firearm. The maximum punishment for a violation of this section is 20 years as opposed to 15 years for a standard burglary in the second degree. If prosecuted under state law each defendant could face over 30 counts (one for each gun) of second-degree firearm burglary as well as theft and destruction of property charges. With the announced involvement of the ATF though, it is likely that if the case is ever cracked the defendants will have to answer for their actions in the U.S. District Court in Greenbelt. The ATF reported over 550 burglaries of licensed gun stores nationwide in 2016. This number rose from 377 in 2015, which represents a disturbing increase of over 50 percent. The illegal market for firearms will continue to thrive as states such as Maryland pass stricter limitations on gun possession and legal purchases, and as a result the ATF and local law enforcement could once again have their hands full in 2017. Benjamin Herbst is a Maryland burglary attorney who also handles gun charges, theft and destruction of property in state and federal court, including juvenile court. Contact Benjamin for a consultation anytime at 410-207-2598. Police search for links between 2 brazen gun store burglaries in M.d., V.a. in 2 days, wjla.com.